HomeConsidering the Unimaginable: Did McElmurry completely fabricate his story of work “IN FLINT” from 2010-2014? Considering the Unimaginable: Did McElmurry completely fabricate his story of work “IN FLINT” from 2010-2014? McElmurry: So obviously Flint was international news but more so then that. You know, we are all residents of the State and you know, I worked in Flint before and for all of us on the team…we felt that this would, you know, this was our family, our kids, I mean we felt, we really felt for the people of Flint…. Question: So Doctor McElmurry I want to take you back in time to your, you had mentioned to the Court you came here in what year specifically to start working in the city of Flint? McElmurry: You know, I’d have to look back at my records. I’m guessing it’s 2010, 2012, sometime like that. Question: When was that <working in Flint>? McElmurry: As I said, for some reason—well maybe five years earlier. I know we had a publication that came out right as the water crisis had kind of gotten national attention, and that was probably two years prior to that we had been working in Flint. Question: And you had been involved in counseling Mayor Walling years ago on water issues in Flint? Question: And I was intrigued on direct examination when you mentioned that you had previously had experience in Flint dealing with the impending, as many communities have, about their municipal water systems, and and that was in 2014, correct? McElmurry: It was. I believe it was before 2014. Question: Well you tell me. I thought it was 2014. McElmurry: I came to Wayne State in 2008, and the work was shortly thereafter, so it was before 2014. Question: Let me ask you, this, in what type of work were you doing in Flint regardless of the time period? McElmurry: So at the time Mayor Walling had,…..very broad discussion about managing utilities and infrastructure in shrinking cities. Question: In other words, the mayor and municipal leaders were trying to learn of the nature of the problem and possible cures, too, right….now how long?…And, for how long did that work in research go? McElmurry: I mean, I remember I was pretty active with that for more than two years I would say. Question: And, then, you have a memory in your mind’s eye when it ended, that work? Question: Right. Well, let’s work with some dates we do know. We do know that the switch to Flint River occurred in the spring of 2014, right? Question: So your research ended before that day? Question: Were you aware of any of the discussion about the water switch obviously prior to April of 2014? McElmurry: I can’t recall how much I was aware of. 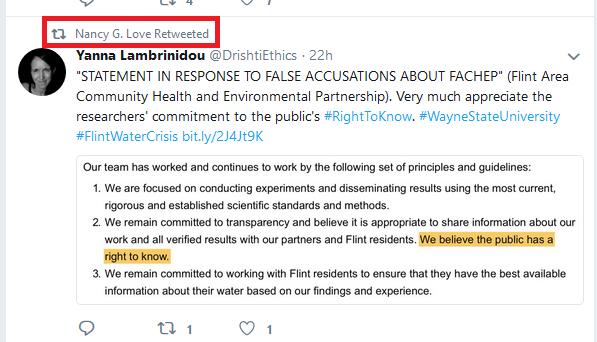 Question: So even though you had done research in Flint, as far as your academic obligations, you weren’t brought in on any, in any capacity, with respect to the water switch? McElmurry: At the time I was doing the work on shrinking cities we never discussed switching to an alternative water source as a way to, in any of those discussions. From the above we created a rough timeline to try and make sense of McElmurry’s research work “in Flint” using his trial testimony and NIH proposal. 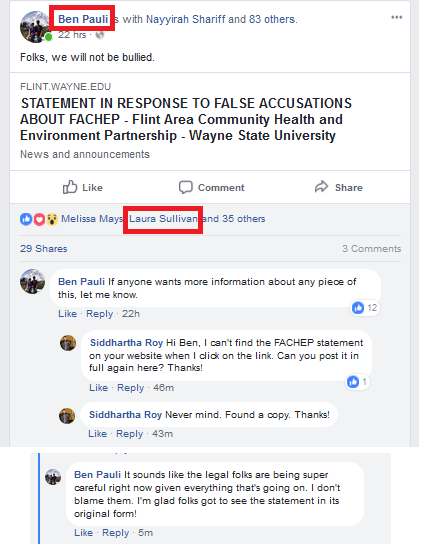 The FOIA of Dr. Faust provided documents, which indicate that McElmurry joined her PhD committee and had his first contact with the City of Flint on her project on January 9, 2013. Assuming that document is correct, the only possible window for Dr. McElmurry’s work is from January 2013 to April 2014 before the switch. That is only 1.3 years even if Dr. McElmurry’s now dubious word is taken as truthful. And strangely, even if he was working “in Flint” in that time-frame and counseling Mayor Walling, McElmurry has now claimed under oath that he had NO KNOWLEDGE OF THE PENDING SWITCH TO FLINT RIVER? Furthermore, Dr. Faust and her advisor, assert that McElmurry did none of the work “in Flint” described in her dissertation or paper. Dayne Walling, supposedly counseled by McElmurry during that critical time period 2013-2014, does not remember any such thing. Nobody has yet vouched for the fact McElmurry even stepped foot “in Flint,” much less worked there for 1.33, 4 or 5 years. “Boots on the Ground?” We are starting to wonder if McElmurry’s sneakers ever touched a street “in Flint.” The only documentation we have that McElmurry did anything at all related to Flint, is his participation in the one January 9, 2013 phone call. It sounds like the legal folks are being super careful right now given everything that’s going on. I don’t blame them. I’m glad folks got to see the statement in its original form! We do not blame them either. We repost the original Wayne State University press release (now deleted) for all interested readers and historians. If our new concerns prove justified, McElmurry may be guilty of perpetrating, one of the most insidious cases of scientific misconduct ever, in relation to procurement of disaster relief research funding. Thanks Katherine. We did see that. What are the chances McElmurry was doing humanitarian work on Flint’s water system from 2010-2015, or even 2013-2014, and the first he heard about ANY water problems in Flint was when Mona was discredited. Note that Mona was discredited very late September of 2015 (look it up) and not summer of 2015. All of that work McElmurry supposedly did counselling Mayor Walling (Walling does not remember McElmurry), and yet mysteriously and conveniently McElmurry “left Flint” before the water crisis in 2014, and the first time he heard about it was late September 2015, and he “returned to Flint” in October not knowing anyone in the city! Yes, it’s a disturbing breech of ethics (obtaining model under seeming false pretenses, the NIH cover letter, creating a seeming false community involvement pretense, and, particularly, possible perjury) that no one was expected to ever notice. However, the fact that unexpected things come out in legal discovery processes was apparently overlooked. It makes other scientists, such as myself, wonder what other items (in pubs or other places) may remain undiscovered. Obviously, no one person can police other academics, however, it is certainly not ‘mean spirited’ to pull back the veil on this one as such disclosure will deter others from following similar all too easy paths to take advantage of others collegiality. The dogged support of the institution suggests a desperation for media attention and/or funding that often accompanies a low national ranking and, on occasion, may possibly even serve to support such behaviors. The public statement, in itself seems unusual under the circumstances; there must have been a significant total amount of $$$ involved. You have the sympathy and respect of many fellow scientists for having noticed this unsavory situation, bringing it into the light, and seeing it through. It truly is an excellent example NSPE (and NIH research) ethics case study for students to learn about. We’ll see where it ends up! Thanks. As you know, we have spoken out repeatedly against the perverse culture of academia. I love science, and I love academia, and if you criticize what you love—well, perhaps no one loves science and academia more than us. If our worst fears prove to be true on this, it is indeed, a really sad story. It is also shocking to see how well it “worked” to obtain millions and millions of research funding, and to consider the highly unlikely set of circumstances, which caused us to question the accuracy of the story in the first place. I mean, call us naive, because we are, but who would think that a trusted professor would just make up a story like that? In our hearts, we still want to be proven wrong.